It's official.. I am the big 3-0. Depressing? No, not nearly as bad as I thought, and my husband (with the help of a few amazing people) threw a surprise birthday celebration that will not soon be forgotten. (more details on that later). For now, let's talk about this amazing giveaway. From the day I first laid eyes on the jewelry from the vintage pearl, I was in love. First, not all hand stamped jewelry is created equal. I've learned that the hard way. This is the real deal. Beautiful, timeless and unique designs I haven't found anywhere else. Are you excited? You should be! Look at these designs. They are beautiful. I have been daydreaming for weeks about how to customize one for myself, my mom, sister or favorite friend. The layered mother of pearl is my absolute favorite... I would need to have quite a few more kids to fill it out, which isn't likely, so I think I'm going to go for the mother of pearl. What design would you choose? Today's winner will receive a $50 gift certificate toward the item of their choice. Good Luck!! *extra entries for facebook, twitter, blog posts etc. (just leave a link back) or for becoming a follower. Being the first to comment is never a good sign...probably won't get picked. But, if I could choose I would go with the mother of pearl as well. It's simple and just beautiful. Plus, I don't think I would ever have enough kids to fill out the layered mother of pearl. I love the Vintage Pearl!! There are so many that I would choose from!! I would get the dainty hearts, The flower and the circle, the dainty drops, or I'd even go for a bracelet! Her stuff is AMAZING!!! Oh my goodness! I love this stuff! I have one little guy right now and another on the way shortly, so nothing too girly will do for me. I love the 'names on a ring' and really like the fact that I could add on to it as our family grows. Your site is wonderful. Happy Birthday! Initial on a chain with the pearl. Initial would be H for my baby boy Hugh! Happy Birthday! Today is my birthday! Yea! (#31) and 30 was TERRIFIC!! Hope you make yours wonderful. I love Vintage Pearl. love, love, love. Happy Birthday! I love the mother of pearl as well. The Flower and a circle one is my favorite! I would love to win! I have been wanting one of these for a long time, I love them! I love "a flower and a circle". I have a boy and a girl and it would be perfect. Thanks for the giveaway. I hadn't seen the layered mother of pearl... that is BEAUTIFUL. i'd totally pick the rectangle names on a chain....so fun! my favorite has always been the 'anna/henry' that's usually pictured ... so simple and so lovely! I love the dainty drops and mother of pearl. Actually, I love everything, but if I had to pick I can narrow it down to those two. Ever since I was pregnant with my first I've wanted to get a necklace like this!!! And now that I'm pregnant with my 2nd, I think it's time to get one! Thanks for this giveaway! Even if I don't win, I'll most likely purchase something from them! I love the flower and circle with the pearl, or maybe their birthstone. And I'd add to it with each child. Oh I love it all!! i really love the teeny tiny initials on a chain! I love the flower and the circle. It's just so pretty and classic. i absolutely adore the circle of love bracelt. hope i win! love you blog. I've been loving the layered mother of pearl for a while now. I almost have 3 kids but I was thinking about putting a quote around the outside disk instead of extra names. I hope you have a very happy birthday and enjoy a week without too much moving stress! Love the bitty blossoms, with the chance to add more blossoms as our family grows. I love your party posts; it's given me inspiration for my daughter's upcoming party, horse themed to celebrate her fifth birthday! Funny Brittany...great minds think alike. :) The layered mother of pearl is making my heart race. I just may be able to fill it up. I SOOOOOO hop luck is on my side. :) Happy birthday!!!!!! I love the one w/the gemstones! I never thought I would want "mom" jewelry but do now! I love "a flower and a circle." Perfect for my two kids-a boy and girl. love love love the circle of love bracelet! I love her products I would love the mother of pearl necklace. It is gorgeous! I have a necklace from her that is my favorite! I'd love to get one for a really good friend. I would choose the rectangle tag charms stamped with my two kid's adoption dates and my wedding date. I've been wanting to start a charm bracelet, and those are the first three I want on there. I love the bitty blossoms. So sweet looking! I love the dainty initial hearts necklace. Simply darling. I'm kind of in love with the eclectic necklace, it would be fun to have a Vintage Pearl charm for everyone in the family, so sweet and simple! I am loving the dainty drops! 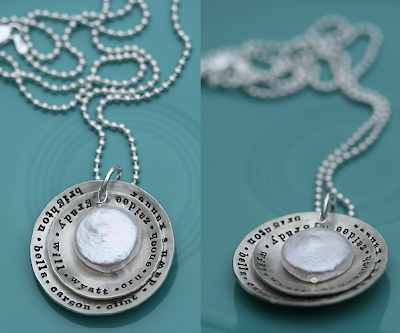 I want something with my kids' names - so either the mother of pearl or the circle of love. Or maybe I'll be generous and get one for my mother. I love Vintage Pearl. The necklaces are darling. I don't know how I could choose just one! I went to the website to pick out one thing and have written down a list! I like the Square name on chain necklace. I love them all, but especially the bracelet. Beautiful jewelry. I love the circle of love bracelet. I have seen the vintage pearl on many of my favorite blogs, and I love any silver jewlery that you would never need to take off. I love everything they have to offer but my fav. would be bitty blossom! Happy Birthday I too turn 30 this year! I sure was thinking I had the luck to win the petunia pickle bottom bag since this was my first time entering into a contest online, but ill try for this giveaway, how sweet of you to give on your birthday! i love vintage pear! i have had my eye on them for a while. my favorites are layered mother of pearl OR layered circle of love!!! It's my mom's birthday soon. I'd love this for her! The layered mother of pearl is definitely my favorite. I would love to give it as a Mother's Day gift with all of the grandkids names. i have had my eye on the mother of pearl for some time now. it really is so beautiful! The dainty initial hearts necklace is my favorite. I love how the rough edges give it more of an organic feel. I think I also love it b/c those are mine and my husband's initials. HAPPY BIRTHDAY!!! I would love to get the simple letter stamped charms for me and my girls to wear. So beautiful! i am loving the Names Around My Heart necklace! I love the layered look mother of pearl. I was just looking into ordering something like this for a girlfriend as a gift to the mother at her shower. She is having her first child and I think the layered look would fit perfect with her name, her husband and her soon to be baby boy! Love the idea! I think my favorite is the hammered star. Although I also love the vintage pearl. What beautiful jewelry! I love the layered necklace but I only have one kid so that wouldn't really work. I think I might do a bracelet though! I love the dainty drops, I even hinted to my husband that I was so longing for it. Her stuff is simply wonderful! So hard to choose..probably the dainty hearts or the bracelet. Great stuff! I follow T&T and TVP. Would love one with my grandchilds name! I would choose either the flower and circle or the two squares. I love the Bitty Blossoms necklace! It is perfect and simple. Several pieces have been on my wish list for awhile, the mother of pearl is one of my favorites. You can't go wrong with any of them! Happy Birthday! I love them all...but the vintage pearl is my favorite. Thanks for always doing these great giveaways...and happy birthday! Happy Birthday to you! I love the bracelet with the washer, simple but gorgeous! I love the circle of love bracelet, it would be so cool to have my kiddos names on it! I would go with the Mother of Pearl. I do love this stuff! I have had my eye on these for awhile and would just love to win one... I love the Dainty Drops or the mother of pearl.. Happy Birthday to you!! I hope you have a great day, inbetween all the packing and stuff. I have to say I would get the dainty drops necklace. Too cute! What beautiful pieces! I would love the Our Family Nest Necklace! So cute:) Thank you so much for the chance to win. Happy Birthday! I love the "a flower and a circle" these are so sweet and lovely and would make a great mothers day gift too! We just ordered the mother of pearl for our Mom for Mother's day! I would pick that one for me but also don't have enough kids. So I would pick the flower one. love the "circle of love". that's my absolute favorite! sweet sweet! I like bitty blossoms. precious. I like the one initial. simple. close to your heart. I love all the unique choices, but the flower and the circle with my boy and girl twins would be my first choice!! Since my daugther will be one on 03/23 and I will be the big 4-0 in April, seems fitting that you would pick me to win! I would love "a flower and a circle". My daughter being the flower and my son the circle! I love the circle charm bracelets! I really like the eclectic necklace. I myself have the sqaure charms necklace, which I love, love, LOVE. My sister is due with her last baby in a couple months and I would be so excited if I could give her a Mother of Pearl necklace with all of her kids' names on it! I know it would be really special to her. I really like the bracelets right now. Maybe one of the circle chain ones? It's too hard to pick! just found out that we're prego with our 2nd... my heart is full and the dainty eclectic choice would be great for us. something that i can "add" to. thanks and happy bday! So beautiful I can think of tons of people I would like to give these to. I was just looking at these a few weeks ago debating on getting me one from myself for my birthday! I love them all especially the mother of pearl! If I don't win this I will one day get one for myself...maybe mothers day or my next b day. I love her jewelry, it is so beautiful. I like the square tags with the names, kind of simple, but different too. Oh, I love the dainty eclectic necklace. Such a beautiful way to honor your family! The bitty blossoms are so sweet! I would pick "square names on a chain" and get my kiddies' names (James and Lily). I have given a few hand-stamped necklaces as gifts to new Moms like me but never received one, despite my hard-hitting hints. Time to buy one myself, I guess! Gorgeous! I would get that layered Mother of Pearl for my mom with the grandkids names. She'd love it! I'm leaning towards the Circle of Love necklace. Though, really, I'd take just about any of them, they are all gorgeous! Oh, I've been eyeing these for a while now! I love the square or rectangle names on a chain! Thanks for the giveaway... And hope you had a happy birthday! I love the little bird! Happy Birthday! Beautiful! I like a flower and a circle--but I'd have to add an extra flower to mine. So cute. So hard to pick! I love the dainty hearts or dainty drops. 'our family nest' and 'dainty names' are my favs! i think this is a great gift for new parents too! yay, so glad i found this site, thank you!! Happy Birthday to you! 30 was when it all started falling into place for me, so I wish you the same peace and serenity of happiness. Enjoy the ride - it only gets better. My fav (and has been for a long long long time) is the eclectic necklace - says a lot about me (eclectic) and leaves the door open for us to expand the fam. Love the randomness and spontaneity of the charms...pure joy. I love The Vintage Pearl. The problem is how hard it would be to narrow it down. But I hope to have that problem!! i want to win! i love the names around my heart necklace! I love the mother of pearl one! I would love love love to win. Unfortunately I am not usually the winning type. I have been eyeing the vintage pearl stuff for awhile. I would LOVE to gift the layered pearl to my mom. It's so delicate, and personal, and...well perfect. I love the Vintage Pearl...on my daily list of blogs, along with T and T! The family nest is one of my favorites...so adorable! Happy Birthday to you! I love the circle of love bracelet. I also like the mother of pearl necklace. Happy Birthday Brit! Oh how I love Vintage Pearl. I've wanted something from thier line for quite some time. I like the layered mother of pearl necklace too. It's delightful. I love the birthstone crystals necklace! All of these designs are beautiful. Happy Birthday! The Circle of Love bracelet would be my choice. I'd love if the layered circles option was available for the bracelet; it's so pretty on the necklace. Thank you for the giveaway. I also love the mother of pearl! Beautiful jewelry! I love the layered necklas too. I would love to wear my boys names close to my heart. I think the vintage pearl is so elegant. Actually, I love most of the designs, but that one is especially gorgeous. I love the square charms! I would love to win! I love the Bitty Blossoms, How adorable!!!! Hope your Birthday was special! I am indeed a True follower! I have always loved birthstones and I love the necklace it has the names as well. Very cute stuff!! what could be more beautiful than wearing your children's names around your neck, so close to your heart. 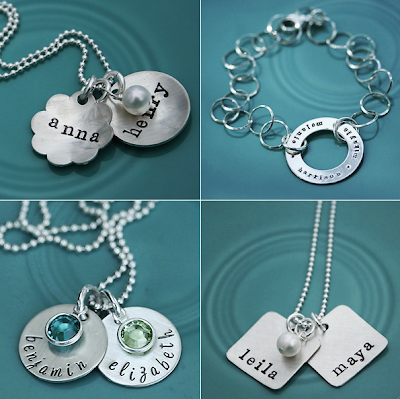 i love these beautiful stamped charm necklaces. my choice: names on a chain - perfectly simple for my completely crazy life! I really like all of them but especially the square and circle layered. I only have one child now but hope to add more so I'd want something we could add to! Love the flower and the circle! So precious! I love the circle of love bracelet!! Happy Birthday! i love the Mama Bird! Happy Birthday! I love the vintage pearl but I'd be happy with ANYTHING on this site! Her work is so pretty! The simple sweetheart is, indeed, very sweet. I'm loving the heart and circle stamped charms in the top left corner. I like the Mama Bird necklace. I'd love to customize with birthstones! The circle of love! It's gorgeous and I'm expecting our fourth! Such beautiful stuff! love the necklace with the mother of pearl. thanks! I would definitely choose the pearls or birthstones for my two princesses! I can't wait to make a grandma gift as well! i love this company's jewelry. I would have to go with "bitty blossoms" or a "circle and a flower" although I would have to do two circles (2 boys). i love love love the layered mother of pearl! and the baby spoons are so simple and precious! So in love with the dainty names necklace.... really---it's just beautiful!!! I have been eyeing these for a while now. Hard to choose...maybe the vintage pearl? Love them! I came upon your blog today for the first time because your guest blogger, Brittany, is a good friend of mine. Looks like I came just in the nick of time. Only 3 hours of entry time left. Whew! I love the flower and the circle! So Cute. Your blog is cute too, I will start checking back often. The dainty drops are so cute/fun. i love the layered mother of pearl! I've seen this site before and adored everything! I think the layered mother of pearl would be just perfect for a grandparent with several grandkids to fill out all the names! Hmmm....something to think about for Mother's day! I personally love the bitty blossoms or mother of pearl. Gorgeous! I love the "names around my heart" necklace. My mom's birthday is next month and she would love one of these, they are darling! I have SO been wanting one of these! How great to carry around my children's names with me wherever I go, and look stylish at the same time!?! I would love the flower and circle! Would love to get the top right hand corner - for my sis on niece's first b-day. It was really hard picking just one but the square names with heart won. I have been eyeing Vintage Pearl for a while now--their stuff is so cute! I would love to win this! My family nest is my favorite and will fit us all :) Love it! I love the initial on heart! I like the Mother of pearl one too! I love the eclectic necklace. Just like me! oh i have ONE and i LOVE it. which show cases all 4 of my children's name. my name and my husbands name! Hope there is still time to enter (not sure what time zone the cutoff was for). I would choose the dainty drops, and I'm following your blog. I love the mother of pearl and will never in my lifetime have enough children to fill it up either but I just might start making some up. I love the font in the design. I would choose Our Family Nest. I love the petal and circle necklace with a little pearl. so sweet.